Tanzania, located on the East coast of Africa, has a cuisine that's been influenced by a number of cultures and flavors. Indian, Middle Eastern, and local African ingredients and cooking techniques are all fused together to form the base of food culture in Tanzania. 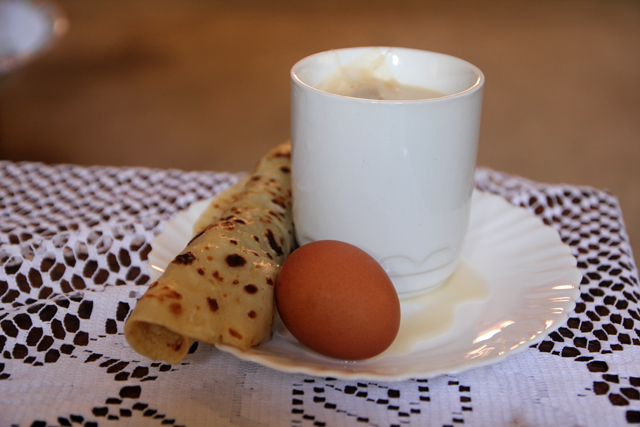 We'll begin with breakfast and then I'll walk you through a day of eating in Tanzania. Wish to visit Tanzania? Book one of these interesting G adventures trips! Like in many countries, breakfast is normally simple and light. Often in the morning people will drink a cup of chai (tea with milk and about 3 spoons of sugar) paired with some type of bread. Common choices are just typical white bread with a thick layer of magazine spread on top, a chapati, or a mandazi, which is a slightly sweet deep-fried square of dough. Uji, a millet porridge, is also a breakfast option. 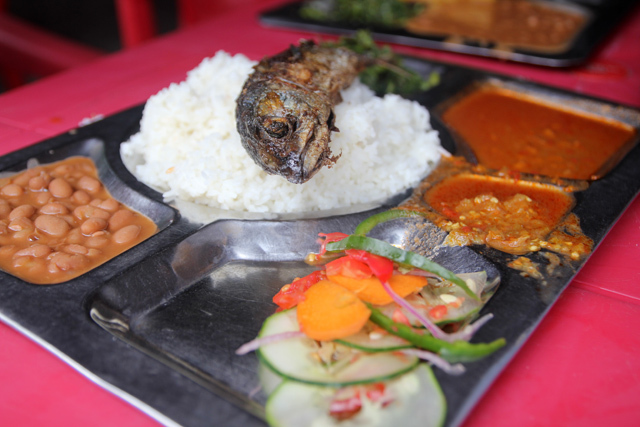 Lunch is normally eaten at about 1 pm throughout Tanzania, and at small local restaurants, there are some great dishes to choose from. Ugali, just like in Kenyan food, is a grain starch normally made from cornmeal or sorghum flour. The flour is cooked with water until it becomes a thick paste. Rice is the second common staple throughout Tanzania. Occasionally along the coast you'll also find pilau rice, or rice that's been cooked with a variety of spices like cumin, coriander, and cardamom. Indian flatbreads, especially chapatis, are also often available. These options make the base of nearly all meals. Along with rice or ugali, beans and a vegetable called mchicha (kind of like spinach) are two of the omnipresent side dishes. The beans are often cooked quite plain, seasoned with a just a bit of salt and pepper and tomatoes. The mchicha is normally fried with oil, garlic, onions, and tomatoes. Rice or ugali, beans and mchicha is a standard Tanzanian meal, and from there you can order delicious things like grilled chicken, nyama choma (grilled meat, which happens to be my favorite), fried chicken, fried or grilled fish (depending on which part of the country you're in), meat stew, or curry. Along the coast, you'll find amazing dishes like octopus curry which is simmered in a rich coconut cream sauce that's seasoned with spices. When it comes time for a snack, Tanzania doesn't have too many options, but what's available is tasty. 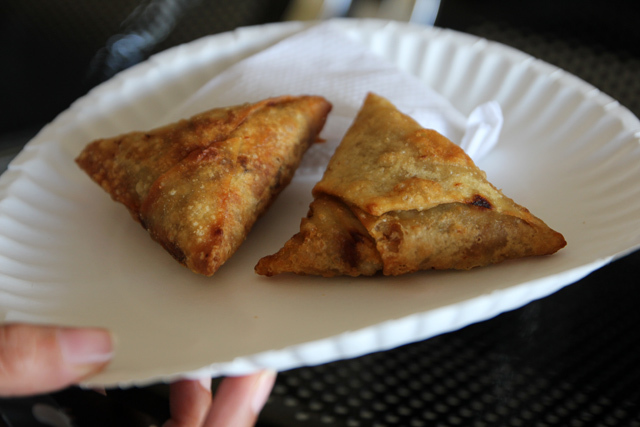 Samosas, originally brought over from India, are available both on the streets and at restaurants throughout the country. There are normally both vegetarian and meat filled versions. The meat samosas are a combination of minced beef with onions, garlic, and spices, all wrapped into a pastry shell and deep-fried. Another of the most common snacks in Tanzania is roasted maize (corn). Using white field corn that's mature, the corn is husked, then slow roasted over open coals until it chars on the outside. The corn tastes best when brushed with some lemon chili salt. Dinner is often quite similar to lunch, rice and ugali with some kind of beans and vegetable, plus a form of meat if it can be afforded. 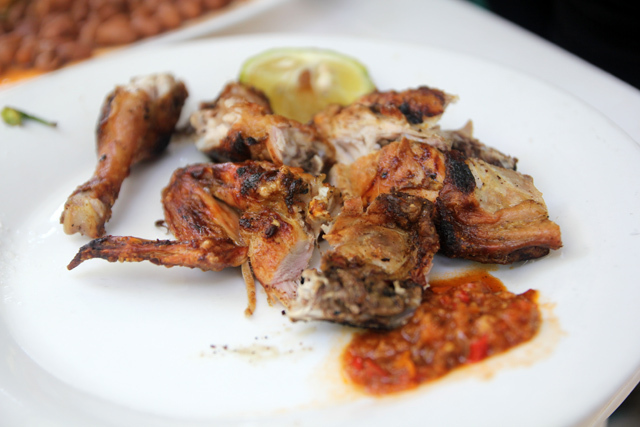 There's also barbecue, which is similar to Indian tandoori or Middle Eastern kebabs, yet it has its own Tanzanian flavors added. 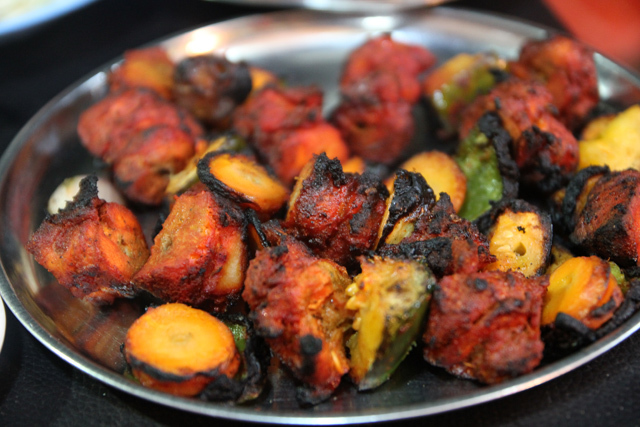 Mishkaki as it's known, is usually made from beef, goat, chicken, or fish, that's marinated, skewered and grilled over charcoal. They roast the meat until blackened, giving it a lovely fiery flavor. Mishkaki is especially popular during the late afternoon and throughout the night for those that want to chow down on delicious piles of tender meat. I like to eat mishkaki with garlic naan or a side of greasy chips (French fries). It's not the most diverse cuisine in the world, but with the influence of both Indian and Middle Eastern flavors, paired with the wonderful tropical fresh ingredients, there are some delicious meals to eat in Tanzania! In two months I’m moving to Tanzania for a year so this is helpful! I love Chai, so glad to see that is common for breakfast! But I better eat up now since I see a lot of rice and beans in my future! Mmmm… this post made me hungry. When we were travelling in Africa last year, it was great to reach Tanzania and regain some of the continents diversity in cuisine. Gotta admit though, we ate a lot of the Indian based dishes. LOVE THAT CURRY! The best restaurant we ate at was Safari Inn in Dar… Soooo good! Right down the street they have some nyama choma too! Yum! I want to try it all. I love your food photos. as much as I love reading about other cultures foods I find it just such a tease! I want to eat it not read about it! Tanzanian food is just amazing. 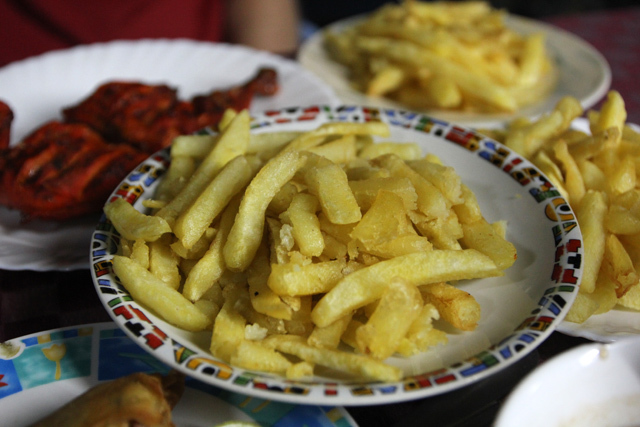 I love the chips and the nyama choma! If you haven’t been to dar-es-salaam, you better pack your bags and go! The chicken and samosas are calling my name! Yum. One of my favorite travel memories is of the street food in Zanzibar. Between the sugar cane juice and the little piles of fresh-cut pineapple, I think my sugar levels are just now returning to normal.